Cuscatlán International Airport (IATA: SAL, ICAO: MSLP), commonly known as Comalapa International Airport or El Salvador International Airport, is located about 50 km (30 miles) from San Salvador in El Salvador. It was built in the late 1970s to replace its predecessor, Ilopango International Airport, which is now used for military and charter aviation. With 2,076,258 passengers in 2008, it was the fourth busiest airport by passenger traffic in Central America. In 2001 it was the busiest airport with approximately 7,000,000 passengers. External view of the Cuscatlán International Airport main terminal building. Comalapa serves as the Main hub for Grupo TACA. The cargo terminal, located a few meters left of the passenger terminal, handles millions of tons of cargo each year. El Salvador International Airport (or Comalapa International) is located 45 minutes from the city of San Salvador. Excellent roads connect the airport with the city. It handles international flights to Central America, North America and South America including some weekly flights to parts of Europe. When the airport was built it originally had only 7 gates. It was designed to handle around 400,000 passengers a year, but the high increase of passengers in the last 15 years brought the airport to its capacity. The airport has had two main expansions in the last decade or so. In its first phase (named AIES I), the airport grew from 7 boarding gates to 12, and later the second phase AIES II, added 5 more gates bringing the total to 17. Along with new gates, new expanded passenger waiting areas were built. Even though all these expansions have been made, the airport once again has reached the peak of its capacity handling over 2 million passengers on 2006. There are several drug enforcement agents conducting random security checks and interviews of travelers at the airport. These agents can be identified due to the items they wear such as a fanny pack, either around the waist or over the shoulder. They also carry an airport access identification card around the neck. One side of the badge carrier shows the airport identification and access card with their photo, the other side of the carrier has the Salvadorean drug enforcement agency official badge. The AIES has a main runway (07-25) 3,200 meters long, 60 meters wide, with an effective running surface of 45 meters and 7.5 meter shoulders. Parallel to the main track and the same length as this, is the taxiway Alpha, which is connected to the track through six starts. For the use of small aircraft, also built a secondary runway (18-36), with a length of 800 meters, which is currently used for parking of "long life" for aircraft that require it. The platform of the Passenger Terminal Building (ETP) has seventeen aircraft parking positions, fourteen of which have their boarding bridges, which connect the aircraft directly to their waiting rooms. The three remaining positions are "remote", ie, passengers disembark at any of them are transferred to the ETP through aerobuses. The ETP has a total constructed area of 34,380 meters square, which houses the waiting rooms and corridors, areas of Immigration and Customs and diversity of stores. The platform of the Cargo Terminal Building (ETC) has three positions for cargo aircraft parking, and also has a platform for the maintenance of five aircraft that require it, just in front of hangars Aeromantenimiento (AEROMAR), a modern workshop repairs that have achieved high levels of service in Latin America and represent an added value for AIES. The ETC has a built area, between warehouses and offices, of 10,286 meters square. This stage, which would have to conclude in May 2012, includes construction of a new passenger terminal and a Rampla to receive aircraft. CEPA, however, still seeks mechanism to ensure funding. Saturation living areas of screening, immigration and baggage at the International Airport El Salvador (AIES) to serve 2 million passengers arrive each year on average has given a sense of "urgency" to the expansion and modernization plan to the airport terminal. So much so that the Autonomous Executive Port Commission (CEPA) is working to initiate in 2008 a stage that has been called "early stage" of expansion, following the presentation of master plan development of the terminal presented by the Paris Airports (ADPI) makes a weeks. "We changed our sense of urgency and although I can not date, I can say that there is interest to move quickly presidential," said Ernesto Altschul, manager of planning autonomously. This phase, which would include building a new passenger terminal, the extension of the maintenance area and a new Rampla for more aircraft, is valued at $ 39 million. The goal, Altschul says, is that at least this piece gray (structures without details) to be delivered in May 2009. "This is part of the effort made to find an immediate solution to existing needs," he added. The cost $ 39 million first phase of construction is not included in the $ 700 million that the ADPI estimated as the minimum investment to meet the master plan of airport development by 2030. Now, with this new phase of expansion, the new CEPA accounts have risen and it is estimated that extend throughout the airport will cost about $ 883 million. Looking CEPA resources and is analyzing a range of financing options ranging from traditional loan from a friendly country to the creation of a "cocktail that could give more armor to the investment," explains Altschul. The Government of Japan, which financed the construction of the port of La Union through its bank cooperation, is the first country that is interested in financing the expansion of flights terminal, and sources say that CEPA is to fund interest one stage or the whole project. We requested an interview with the Japanese Embassy in the country, but until the end of the note there was no response. The French Government, for its part, which funded with $ 500,000 grant master plan development, has shown interest in helping with the equipment of the terminal. In addition, Altschul added to the deck of options that have shown interest in multilateral organizations like the World Bank, Inter-American Development Bank (IDB) and the Central American Bank for Economic Integration (BCIE). Other mechanisms ECA also has shown interest in funding this project with the mechanism known as build, Operate and Transfer (build, operate and transfer or BOT in english), would imply that CEPA operator site and build and manage infrastructure. Other alternatives are that CEPA will become a holding company that sells some of the actions of the terminal, creating a land trust or to establish a public-private partnership that allows entities such as Pension Fund Administrators (AFP) funding with the state infrastructure.. The airport's modern facilities include duty-free shops, fast food and full-service restaurants, bars, air conditioned areas, tourist facilities, car rental, and spacious waiting rooms. With space for 17 airplanes on the main terminal, 3 on the cargo terminal, 5 in Aeroman, and around 20 in the "Long Term Parking" which is runway 18/36. 94.5% of the airport's flights are on time (2005 data). The airport and runway have been closed at least 10 times in the almost quarter century since opening. They were closed for several hours following the devastating earthquake of 2001, followed up with minor repairs to the east end of the runway. They were closed again for several hours in 2005 due to Hurricane Stan. Although the airport is located near the Pacific Ocean, storms and hurricanes are not frequent. The Main Terminal is divided into 2 parts the Upper Terminal and the Lower Terminal. Its currently in the process of building it will be opened by 2012. 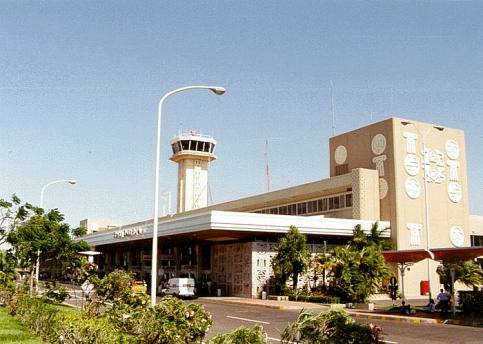 The international airport of El Salvador, based in the town of Comalapa (La Paz), today received an international certification from the Civil Aviation Authority (CAA), after an investment of $ 8 million and a process of four years and two extensions . The document credits the Salvadoran airport terminal compliance with all safety regulations issued under the Civil Aviation Organisation (ICAO), on fire control and health care, removal of rubber from the runways, lights and and safety signs. This certification will enable El Salvador to keep the category 1ante Federal Aviation Administration United States. "From the start of operations of the airport in January 1980, the terminal has been characterized by its safety," said Ricardo Sauerbrey, head of the Salvadoran terminal. We will be the only country in Central America with airport certificate, the executive said a few days ago. The deadline to complete some of the comments was 31 December when the last extension granted by the CAA. LGT PAPI Rwy 07 GS 2.5 . TFC PAT Left tfc all rwy. Rectangular pat alt Rwy 07-25, 1000'.